I've had numerous requests for Elliptic Equalizer filters to use with the Stereo Width Controller. Conventional Elliptic Equalizers are usually first-order with vertical to lateral crossover and left to right crosstalk curves that are both 6 dB per octave. When a second-order (or greater) low pass filter is inserted into the Stereo Width Controller's side chain, which subtracts side to produce mono, an interesting thing happens. While the low frequency benefits of a second-order filter are the same as a first-order, the undesirable effect on the mid and high frequency stereo image is less when the filter is second-order or greater. Sometimes, in addition to EE, an increase in midband or high frequency width is also needed. A broadband width control can narrow or widen width, but not do both at the same time. This thread explores a second-order Elliptic Equalizer combined with Width Enhancement. Remember that Lateral modulation is Mono, Sum or Mid, while Vertical modulation is Difference or Side. The first family of curves show the relationships between Lateral, Vertical, Left and Right with Left-only modulation and a 300 Hz second-order Elliptic Equalizer. Curves showing the relationships between Lateral, Vertical, Left and Right with Left-only modulation and a 300 Hz second-order Elliptic Equalizer. The lateral mono sum is always unity. The vertical difference signal has a 6 dB per octave slope. The Left and Right channels begin to blend below 300 Hz. Below about 50 Hz they are fully mono. The Right channel's crosstalk from the Left falls at an approximate 12 dB/octave rate in the midrange. By using two parallel filter paths it's possible to Elliptically Equalize, which collapses low frequencies to mono, and expand or reduce width. In the example plotted above the EE low pass filter was set at 300 Hz. The Right channel crosstalk curve shows the -3dB point of the filter. A second high pass filter, operating in parallel, can expand or reduce width above the EE frequency. To prevent width expansion from undoing the work of the EE filter, a guard band exists between them. A high pass filter at 1 kHz was chosen to separate the work of the two filters. The following set of curves show the Lateral and Vertical responses for Left-only modulation when both the 300 Hz Elliptic EQ is engaged and the Width above 1 kHz is expanded to 200%. Lateral and Vertical responses when a 300 Hz Elliptic EQ is engaged and the Width above 1 kHz is expanded to 200%. The Vertical gain above 1 kHz is 200% (6 dB greater) than the Lateral showing Width enhancement of 200%. Below 300 Hz the signal blends to mono. It is possible to implement both Elliptic EQ and Width by having a split filter path. The advantage of higher-order EE filters is that there is less blending in the midrange and high frequencies providing more accurate imaging. I don't know if this is similar to derived loudspeaker crossovers where one active filter is subtracted from unity to generate the other output. The real filter can have multiple pole response, while the derived output is only -6dB/oct. It's exactly that JR - a derived filter. I think we can learn from cross-overs how to make a better EE. There's an Elektor Electronic article from September 1987 I need to find. JR. wrote: ... derived loudspeaker crossovers where one active filter is subtracted from unity to generate the other output. The real filter can have multiple pole response, while the derived output is only -6dB/oct. Firstly, in theory, you can have both outputs 'symmetrical' (eg have the same order slopes) but you have to accept peaking before (and after) the xover point. The higher the order, the greater the peaking. Secondly, even at 2nd order, the 'real' filter needs VERY tight tolerances otherwise the derived filter will revert to 6dB/8ve. IIRC, there's a couple of AES papers and also an Audio article in the late 70's on this. Neither picked up the 'tight tolerance' issue. Douglas Self writes about subtractive crossovers and the tolerance required to obtain high order in the derived response in "The Design of Active Crossovers." Baggen, "Active Phase-Linear Crossover Network," Elektor, September 1987 pg. 61. Lipshitz, "Active Phase-Linear Crossover Networks of High Slope Derived by Time Delay," JAES 31 1983. I don't think the peaking is easily solved. One other quirk is that the vertical crossover point is 1/2 (or one octave) lower than the measured crosstalk crossover point. A 300 Hz EE filter provides a 300 Hz -3dB point in the Left to Right crosstalk curve but the Vertical crossover is 150 Hz. A 12 dB/octave filter has some advantage but not enough IMHO. The peaking in the Vertical domain with a third-order is fairly significant. In listening tests I liked the effect of the peaking. In the lower midrange with the EE frequency quite high I could hear it. What it did was slightly widen the image before it began the LF collapse to mono. It wasn't a frequency response error - the voltage sum of left and right (aka mono) is constant. It was actually quite pleasant though it looks bad on paper. It was also very effective at reducing the LF "ellipse" without blowing imaging. Comparing MS to LR +/-S methods of Elliptic Equalization gets kinda interesting. When Side is high pass filtered in the MS domain the subtractive process reconstructs L and R.
When Side is low pass filtered in the LR +/-S method the subtractive process deconstructs (removes) Side. We can see from the plots that the subtractive process gets the short end of the stick. When the Width Controller is used to perform EE the subtractive produces the Vertical (Side) response. Vertical has only a 6 dB/octave slope regardless of the filter order and receives peaking with filter orders greater than one. In the MS domain the subtractive process reconstructs L and R.
It would seem to follow that Vertical would not receive peaking (it is Side) but L and R would. Vertical will have the same filter order as Side beacause they are by definition the same thing. L and R, being derived by subtraction, will have crosstalk curves which have peaking and fall at 6 dB/octave regardless of filter order. Today I intend to look at L and R responses when Side is high pass filtered and reconstructed in MS.
Vertical will have the same filter order as Side because they are by definition the same thing. Second-Order Elliptic EQ Using Mid Side. The Vertical has a 12 dB/octave slope; the crosstalk has a 6 dB/octave slope. The Left and Right have a complimentary peak and dip. Note that the filter cutoff frequency is equal to the Vertical 3 dB point and not 1/2 Fc as it is using the LR +/-S approach. I remember a while back when Wayne was first working on this he sent me two files to check out. One was a standard EE first order response and the second file was the derived filter. I do remember that the derived EE didn't perform as well for vertical modulation. It may have not been a fair test at that point. I can't remember whether I was comparing with the derived filter set an octave above the first order so the vertical crossover points were the same. I'm up for testing how the different versions perform while cutting. I just confirmed that the Vertical crossover of the two test files were and octave apart. So it wasn't a fair test. I wanted to drop back in with an update. The last couple of days I've had both EE methods on the bench and can compare them side-by-side. It appears both have their pros and cons. With 6 dB/octave filtering both work pretty much the same. The advantage of using the Width control is that the response can be shifted up and down to provide a LF Width which does not converge to full mono. The MS can also do this but requires external gain control. At higher orders MS and LR +/-S behave differently. There are two distinct applications for "bass to mono" that I see. One is elliptic equalization to reduce vertical modulation during cutting at low frequencies. The second is bass focus. Bass focus is ideal for headphone crossfeed to prevent "out-of-head" experience, as well as subwoofer steering and vinyl playback warp reduction. Filter orders of two or greater produce asymmetric responses. Using MS the vertical cross-over slope is the filter order with crosstalk falling at 6 dB/octave. Peaking occurs in Left and Right but not mono (lateral) or vertical. 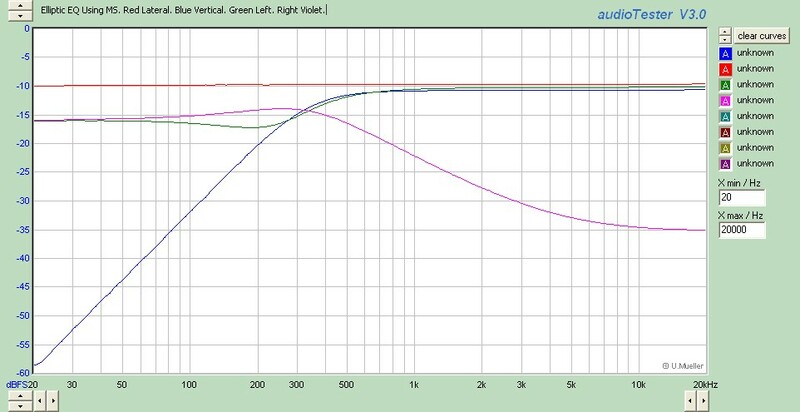 With LR +/-S the vertical crossover is 6dB/octave and has minor peaking. The crosstalk slope is the filter order. 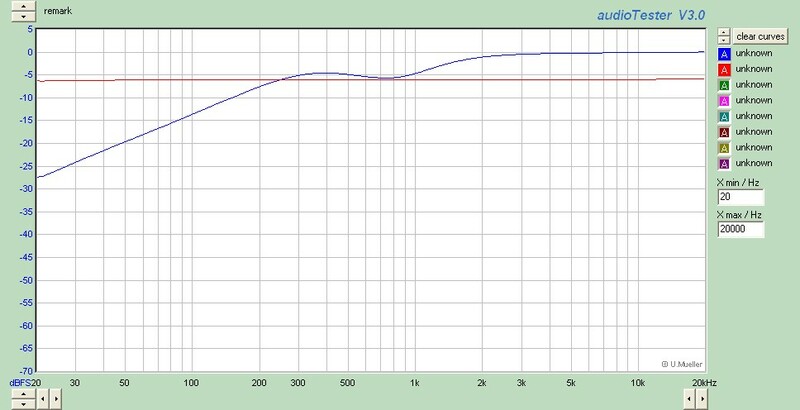 Limiting vertical modulation in vinyl cutting is made far more critical due to the extreme amount of low frequency boost of the RIAA playback curve. At 20 Hz it's just shy of +20 dB. The higher filter order available to the vertical channel in the MS method of providing elliptic EQ makes it far more suitable for mastering. A simple 6 dB/octave EE, to provide 20dB attenuation at 20 Hz just to offset the RIAA curve, requires a -3dB point a decade higher at 200Hz. At EE frequencies >200 Hz the midrange gets significantly blended. A filter order of two or greater does not require as high a cutoff to be as effective. Vertical modulation problems in the extreme low end can be filtered with better precision. Although the crosstalk falls at 6 dB per octave it can be made to fall at a lower frequency. Controlling LF vertical modulation is the reason for using an elliptic equalizer it follows that having no peaking in the vertical channel in addition to the steeper slope is a big advantage. Bass focus has different requirements. 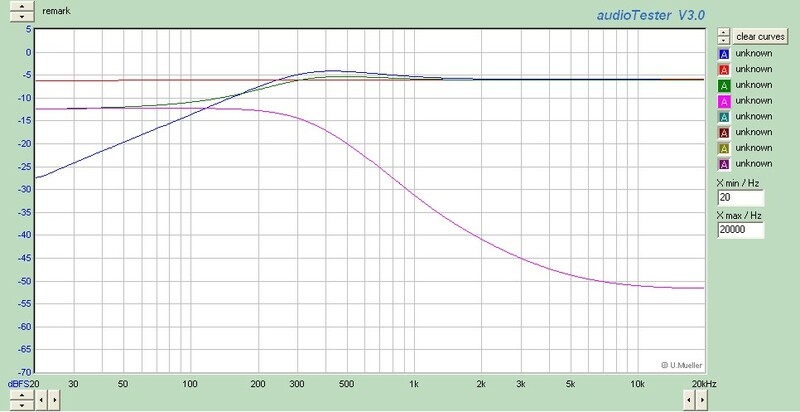 Headphone LF crossfeed, subwoofer steering and vinyl playback benefit from the sharper crosstalk curve of the LR +/-S method. It gets out of the midrange faster at a slope determined by the filter order. The 6 dB/octave slope of the low frequency blending - the "vertical" component - is far less critical and the peaking does not result in groove-jumping. In fact, the lazy 6 dB/octave blending slope may be better. Unfortunately I was not able to find a way to use both together and obtain symmetric high-order slopes. The answer to "which is better" depends on what the goal is: Cutting or Monitoring. I do want to toy with using delay compensation to obtain a symmetric response. The MS approach is ideal for this since only one path, Mid, requires compensation. Response errors due to component mismatch fall in the crosstalk curve which is less critical than the vertical. For these reasons, with higher filter orders LR +/-S is, IMHO better-suited for bass focus. MS wins for vinyl cutting.